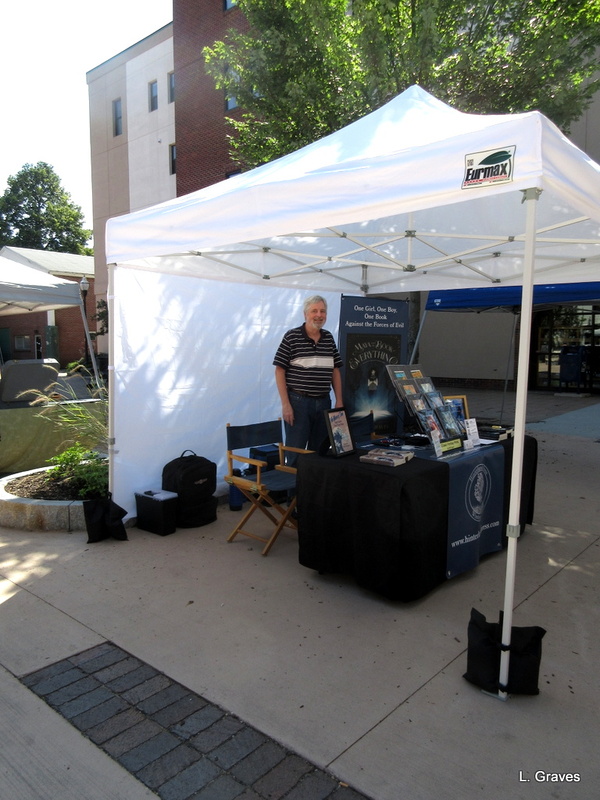 On Saturday and Sunday, Clif and I went to two events to sell our books—Maya and the Book of Everything and The Wave of Time. A busy weekend but a good one. 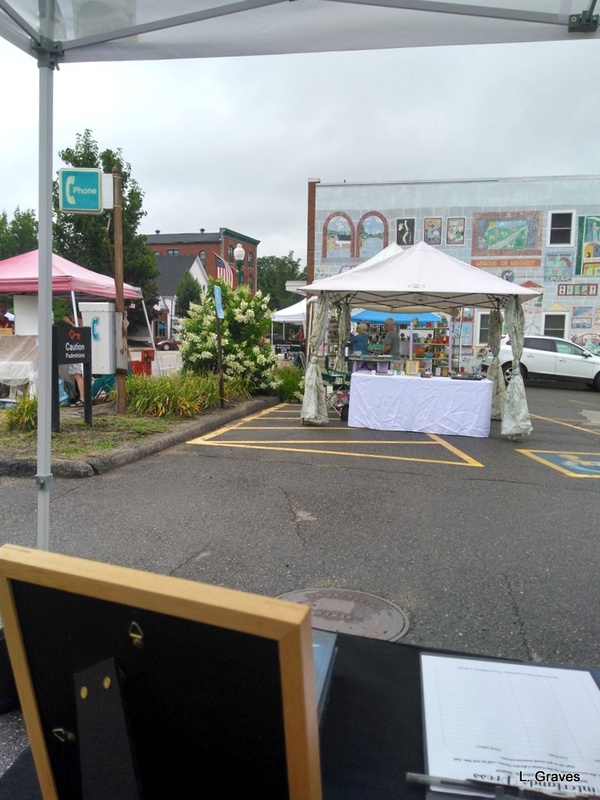 On Saturday, we set up at the Winthrop Sidewalk Art Festival, which was right in our own little town. How nice it was to only drive a mile to get to this event. On the other hand, the weather was far from nice. In the morning, it rained, and when the rain stopped a high wind blew through town. Here is the gray view from our booth. Nevertheless, lots of people—bearing umbrellas—came to the art festival, and we sold quite a few books. So despite the bad weather, we did well. The next day, Sunday, was a much better day, and off to Lewiston we went to the Sunday Indie Market, which had a fun, funky vibe. 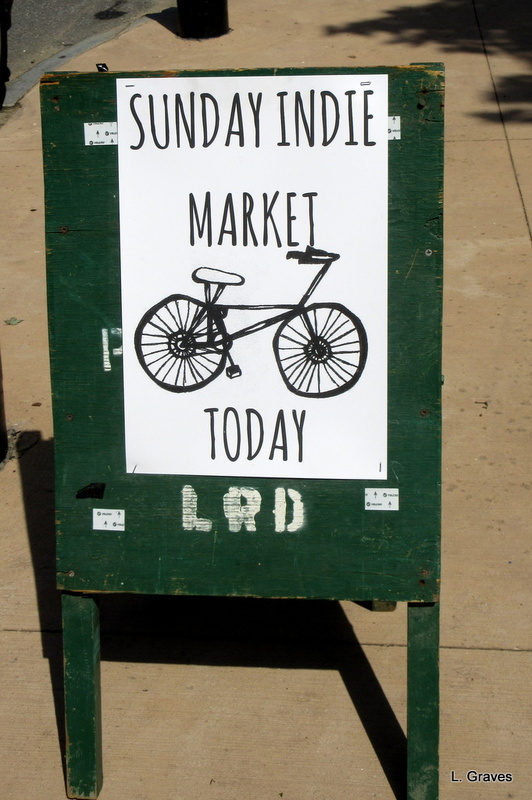 Unfortunately, there was another big event in the area—a balloon festival—so not many people came to the Indie Market. No matter! We still had a good time, and we loved being a part of the Market. We enjoyed being on the city sidewalk and hearing a clock in the distance chime at noon. On one side of me was Courtney Schlacter from Quiet City Books, which is not far from where the Indie Market was held. Three copies of Maya and the Book of Everything soon will be in her store, and for the December Indie Market, we’ll have a pop-up table at Quiet City Books. On the other side of us was Bella’s Best Sweets & Treats. Oh, my! 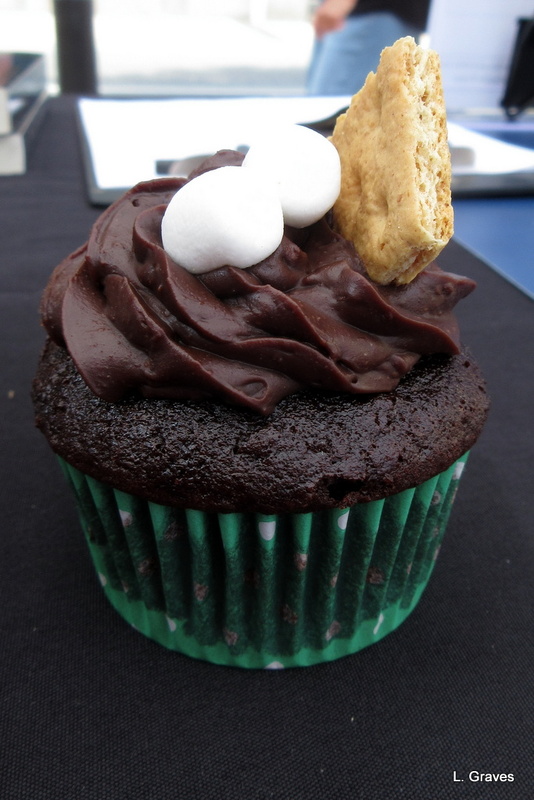 I, of course, succumbed to a cupcake, and it was ever so good—moist, chocolatey, and filled with cream. And, yes, I did share it with Clif. 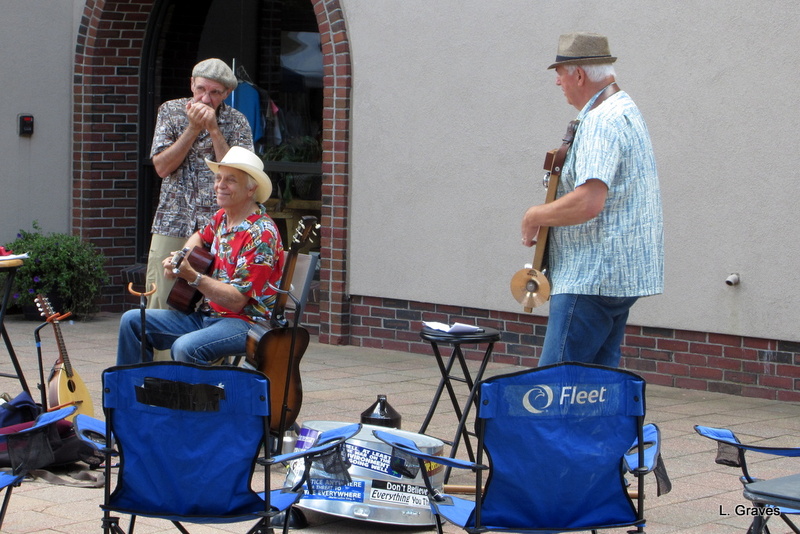 Nearby, to add to the fun, a folksy, bluesy band played. Not a bad way to spend a sunny Sunday afternoon! And kudos to the Indie Market group who, among others, is helping to revitalize Lewiston, a factory city that has been down in the heels for quite a while. Fun events. Glad you had a successful time – and that cup cake – mmmmmmmmmmm – A nice reward! Glad to read that you did some business despite the weather and that your Sunday market is helping to revive a down-at-heel neighbourhood. We do! But it’s work we love, so we consider ourselves very lucky indeed. I love markets … They really bring the community together & a great way to revitalise a city. Lovely that you were able to sell so many books ( when the weather is not great everyone thinks of reading!) and your cupcake looked Divine! Hear, hear! And Lewiston needs plenty of help. Hi Laurie. I know I’m stating the obvious, but here goes anyway: These kinds of events are real good. You don’t find them everywhere. Maine is a fine place! Well, that wasn’t obvious to me. 😉 No fairs and festivals where you live? Hi. My region has lots of them. I’m tired just reading your post !! But sounded like it was successful ….and fun!! We were tired on Monday, but it was indeed both fun and successful. Kudos to you for doing back to back events. So much work goes into these. Glad there were some perks for doing it. So glad to hear that your book is selling well, and that you share your cupcakes! Thanks, Derrick. As an indie publisher, it’s crucial that we go to events to promote our books. Luckily, both Clif and I enjoy getting out and talking to people about our books. Hard work but rewarding, and both Clif and I enjoy talking to people about our books. You’re really making the rounds this summer, and I imagine you’re learning a lot that will serve you well in sales to come. We certainly are. And our fall/winter schedule is filling in, too. Luckily, both Clif and I both enjoy getting out and talking to people about our books. During the week, we are mostly at home, which is fine, but it’s nice to be out on the weekends. The weather is certainly not cooperating this summer, but it looks like it was still a great weekend! That cupcake looks absolutely delicious and congratulations on another successful weekend at the festivals. Wonderful to read about the Indie Market group and others trying to make a difference in local communities. Lately, the weather has been pretty good in Maine. At least compared with what it has been. Yes, there is a group of talented, energetic young people in Lewiston who are doing a lot to revitalize the shabby city. Looks like a good day, with a lot going for it. Keep up the good work! 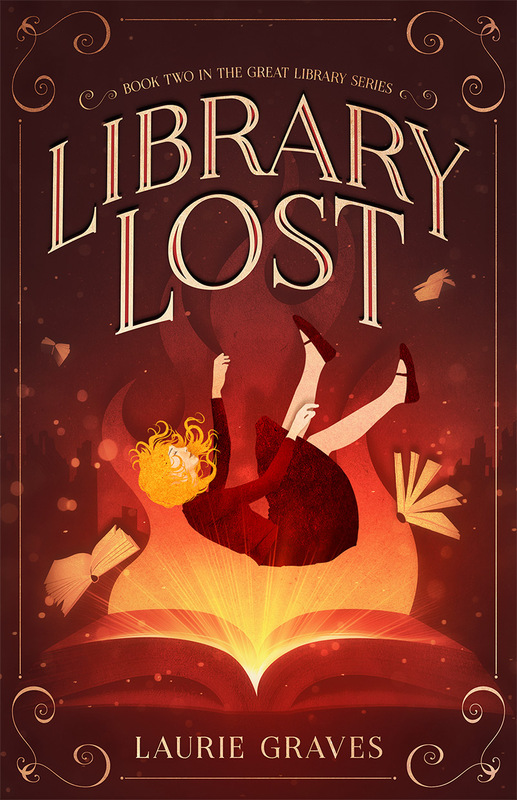 A great weekend overall – happy for your successes with your books!